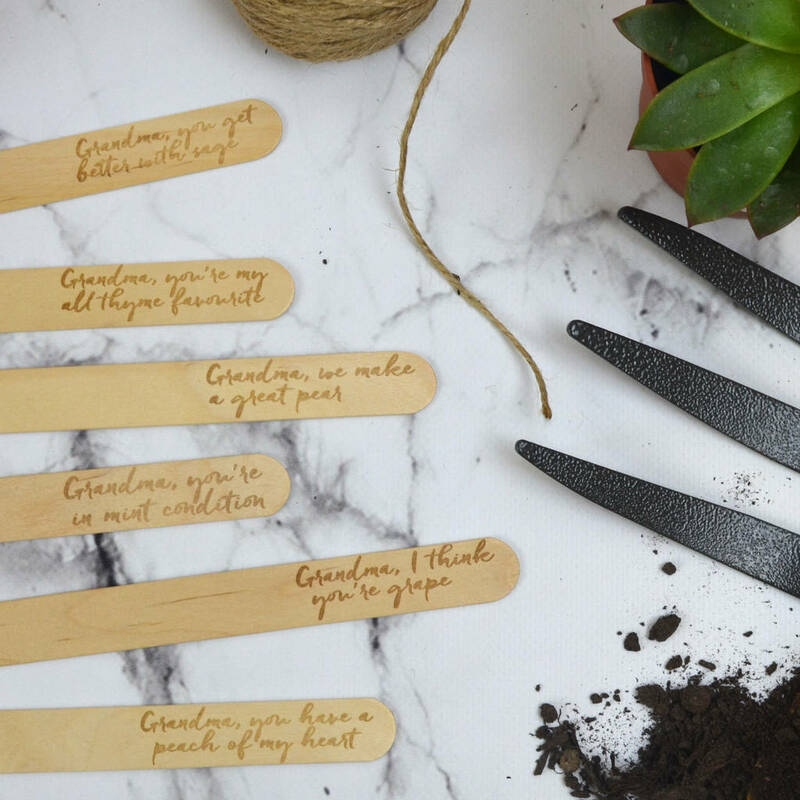 A plant marker set with gardening based puns makes a fun gift for grandma. Can be personalised with engraved tag and organic flower seeds. 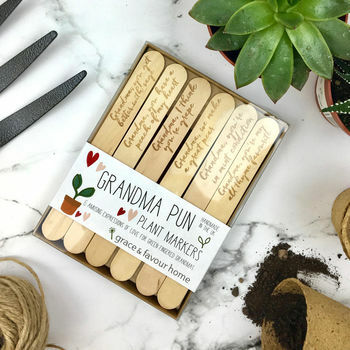 A fun set of six plant markers, engraved with puns based on a gardening and love theme, these make a lovely gift for grandchildren both big and small to give to their treasured grandparent for Mother's Day, birthdays or just because! Why not add a pack of organic flower seeds to make sure your gift keeps giving in the months to come. Planting the seeds together and watching them grow will make a great bonding experience. 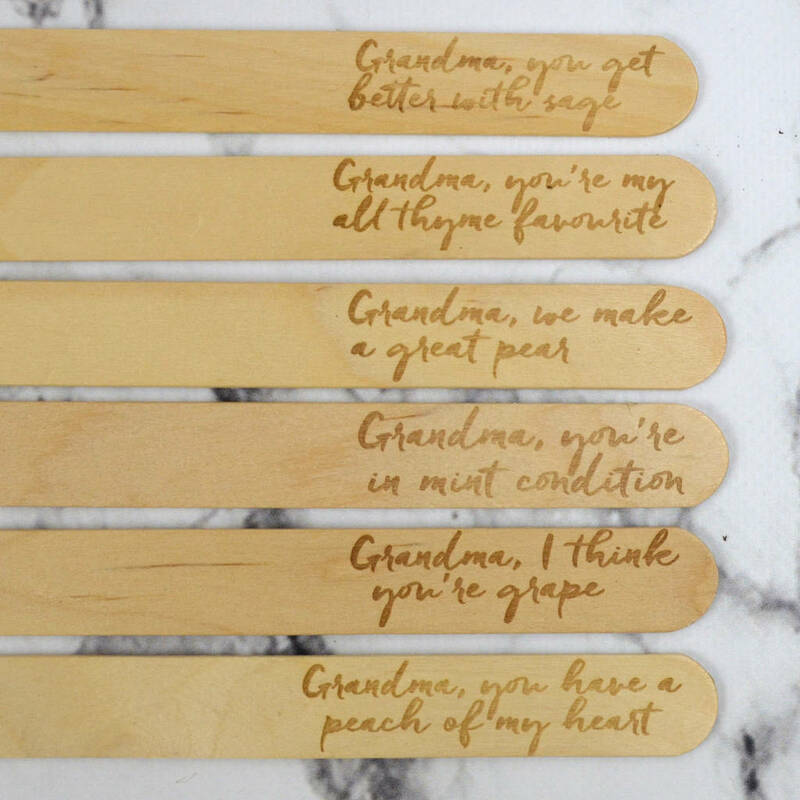 The sets features 6 amusing puns, with one of each of the following phrases: 'Grandma, you get better with sage', 'Grandma, you're my all thyme favourite', 'Grandma, we make a great pear', 'Grandma, you're in mint condition', 'Grandma, I think you're grape' and 'Grandma, you have a peach of my heart'. 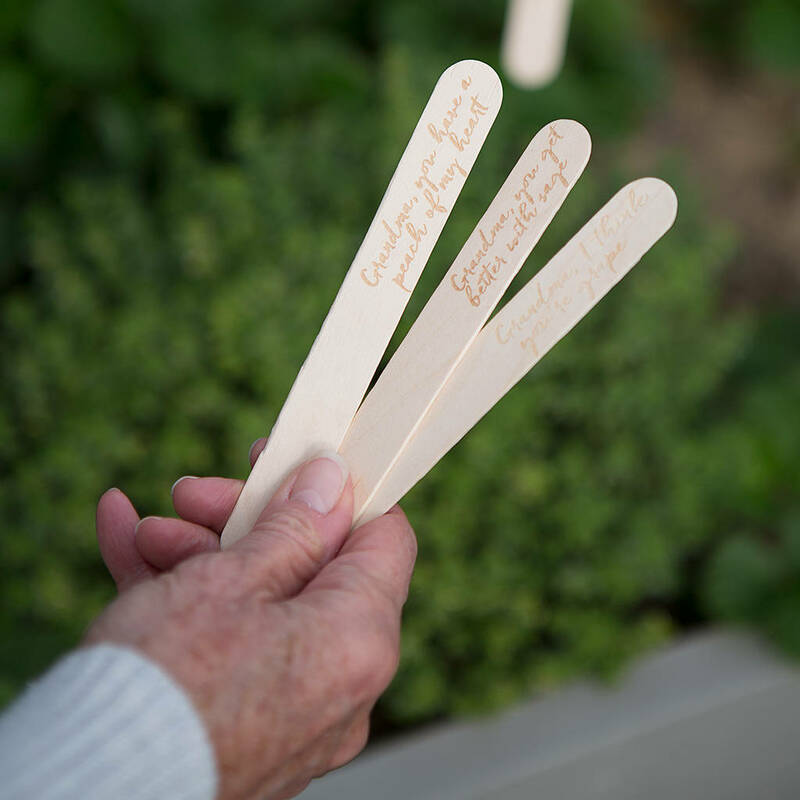 You can also choose to replace 'Grandma' with 'Nana' or 'Granny' on the plant markers. 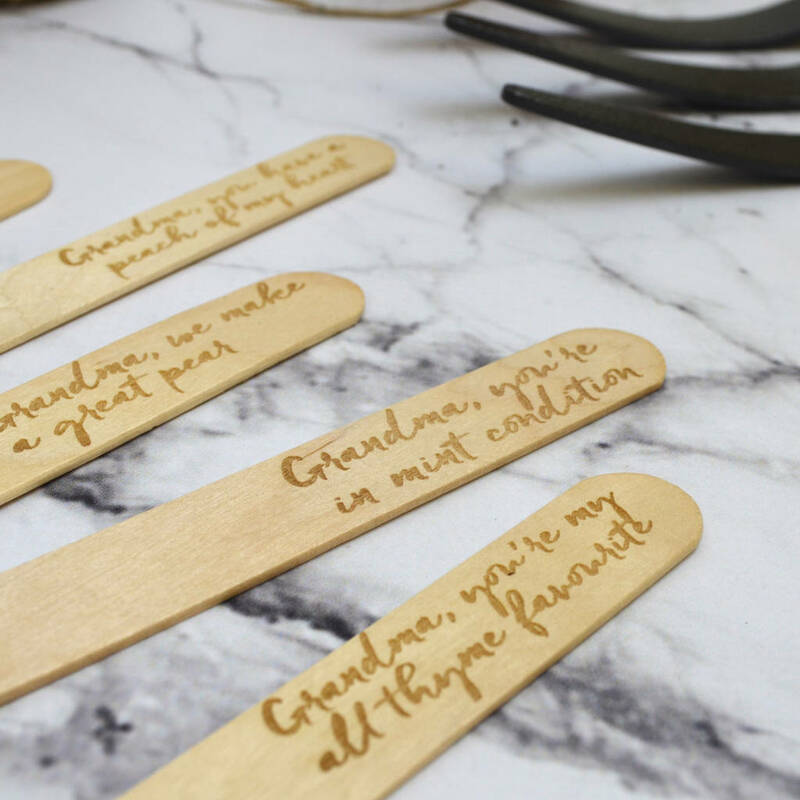 Each set is beautifully presented in a kraft box, perfect for Mother's Day and an optional personalised wooden gift tag can be added with a laser engraved custom message. Organic seed options - Sweet William, popular biennial, mixed colours. Sweet Pea, Heavenly scent in a mixture of colours. Poppy, large red, white and pink flowers. Cornflower, traditional blue cottage garden flower. Sunflower, Fabulous double golden-yellow flowers. Pepper, 'Long red Marconi', an attractive long, red sweet pepper. Carrot, 'Bambino', lovely sweet taste baby carrot. Wild rocket, dark, green spicy leaves. Beetroot, 'Chioggia', mild flavoured, very attractive beet with white and pink rings running through it. Chives, Perennial herb with a mild onion flavour. Basil, 'Sweet Genovese', Popular culinary basil with a fine aromatic flavour. Sage, Perennial culinary herb for use in casseroles and stuffings. Made from 100% biodegradable wood, laser engraved in our Devon studio. 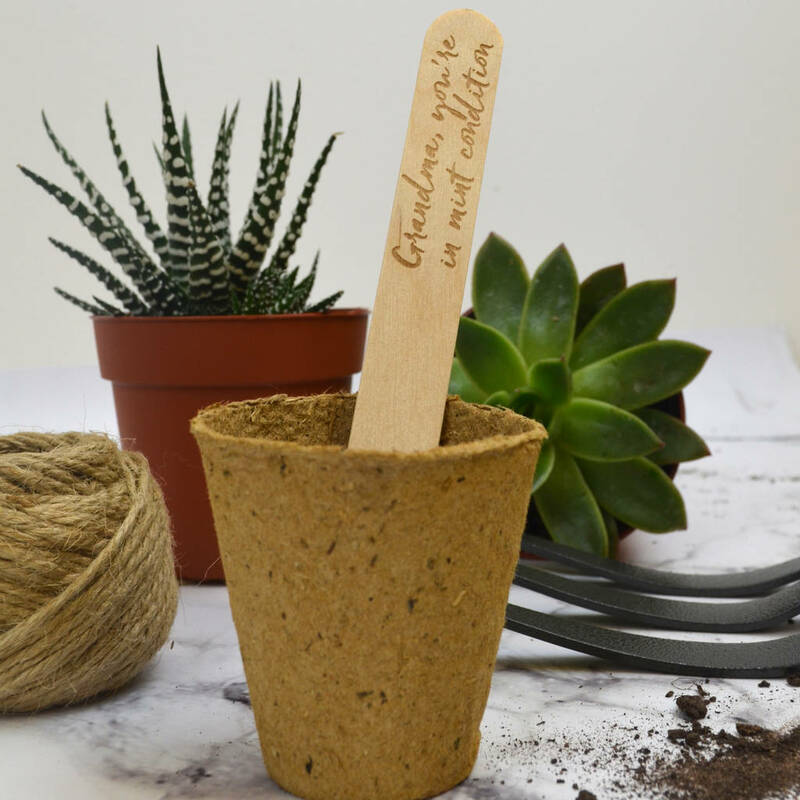 Seeds are organically grown and specially chosen with full planting instructions included.